It may be hard to believe now, as blustery generals run Thailand, the army busts up gatherings of political opponents, and junta rule—in one form or another—seems like it might never end, but the country was once touted as an example of democratization. I myself made this argument in the 1990s and early 2000s. The country had held multiple free elections and passed one of the most progressive constitutions in Asia. It had a vibrant press, and regularly witnessed massive public rallies led by civil society groups. I lived in Thailand from 1998 to 2001, and at that time society seemed to be overflowing with political discussions, arguments, and contested elections. I was hardly the only one to praise Thailand at the time. Freedom House rated Thailand as “Free” in their 2001 edition of Freedom in the World, their annual survey of each country in the world. (Thailand is now ranked “Not Free,” after having been ranked “Partly Free” for much of the 2000s and 2010s.) As I noted in a 2013 edited volume, Pathways to Freedom, many of the U.S. officials who traveled to the kingdom during this time lavished praise on its maturing democracy, an example of a place where the army had returned to the barracks for good. The reversal of Thailand’s democracy began in 2001 with the election of the populist leader Thaksin Shinawatra. Both during the campaign and as prime minister, he excelled at recognizing and manipulating public grievances. He preyed on working-class Thais’ legitimate feelings of economic injustice. He also, however, outlined a real policy platform to address injustices, and succeeded in instituting populist policy reforms, many of which benefitted Thai society. Unfortunately, some of these reforms were enacted at the expense of democratic norms and the rule of law. Then, when some middle-class and elite Thais realized that liberalism was being undermined, they took the wrong steps to fight back. There is a larger lesson to be learned from the trajectory of politics in Thailand. To gain power, Thaksin used political tactics very similar to those more recently adopted by leaders from Turkey and Hungary to the Philippines and, now, with the presidency of Donald Trump, the United States. Thaksin emerged after a period of austerity in Thailand, and like Law and Justice in Poland combined skillful pitting of rural voters against elites with effective economic policies. And like Rodrigo Duterte and many other modern-day populists, Thaksin identified dangerous “others” and targeted them, often while using these “others” to shore up his law-and-order credentials. Thaksin’s own anti-drug war in 2003—along with a broader war on “dark influences” that was popular with much of the public—utilized extra-judicial killings, and was eerily similar to Duterte’s current drug war. 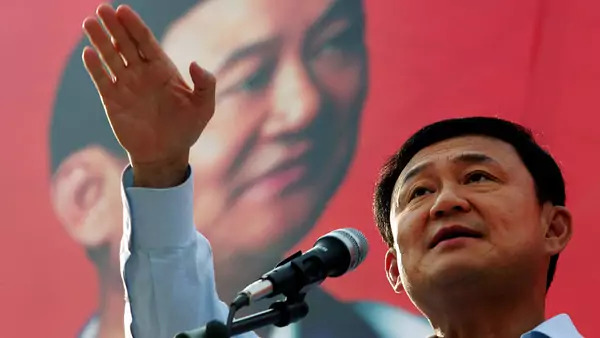 Thaksin also often highlighted his own wealth, positioning himself as the one man who could take measures to boost the economy, even if he did so without following democratic norms. This “I alone can fix it” style predated that of Narendra Modi, Duterte, and Trump. For more on how Thailand was “patient zero” in the global democratic regression, see my new review in the Washington Monthly.